Happy Memorial Day Weekend! It’s that time of year when pool owners are faced with the task of getting their pool open and ready for use. This article will focus on some of the pertinent pool water parameters that need to be checked and maintained in order to get a healthy pool right from the start of the season. There is also a more detailed section on chlorine to promote a better understanding of its use. Usually the first step of opening a pool consists of removing the pool cover and recoiling in horror at the sight of the chunky, green, murky water. That appearance is due to a variety of algae and other microorganisms that have had the benefit of not being subjected to effective chlorination over the winter. The reason for the ineffective chlorination can be explained by simple thermodynamic chemistry rules that come into play when the temperature drops. Everybody probably remembers Le Chatelier’s principle and can figure out how it applies to dynamic equilibria in the context of exothermic and endothermic reactions but just in case some people forgot how it works I’ll use the example of pure water, which exists in a dynamic equilibrium with hydrogen and hydroxide ions. The formation of hydrogen ions (towards the right) is an endothermic reaction (absorbs heat). Le Chatelier’s principle states that if you make a change to any equilibrium then that equilibrium changes to a new equilibrium in order to counteract the change. Higher temperature affects the above equilibrium by “adding heat” to the equilibrium. This shifts the reaction to the right. The pH is a measurement of hydrogen ions and having more of those ions results in a lower pH, meaning that pure water has a lower pH at higher temperatures and a higher pH at lower temperatures. This is one reason why pool pH increases during cold weather. The killing power of chlorine is not due to chlorine. It’s due to hypochlorous acid. Our own white blood cells use hypochlorous acid to kill pathogens. Chlorine (free chlorine) and hypochlorous acid exist in a dynamic equilibrium where chlorine (Cl2) and water react to form hypochlorous acid (HOCl) and hydrochloric acid (HCl). The water equilibrium is embedded in this equation and the same rules regarding temperature apply. Higher temperature shifts it to the right which results in more hypochlorous acid and better disinfection. Colder temperatures mean less hypochlorous acid and less disinfection. Measuring free chlorine when it is cold right out of the pool may give you a free chlorine level that’s on target but it doesn’t tell you much about the hypochlorous acid level. It’s known that a given level of free chlorine has variable disinfection power based on temperature with lower temperatures being less effective than higher temperatures. One approach to counteract this is to use a higher free chlorine target level in order to force a shift to the right and produce more hypochlorous acid. Equation 2 represents what happens when chlorine gas is used. The equation, when applied to inhaled chlorine, predicts that it will react with water on mucosal surfaces such as lung tissue and produce hydrochloric acid. #chemicalwarfare. Chlorine gas is used in saltwater pools where it is generated by electrolysis of salt in the water which converts rapidly to liquid chlorine in the sanitizer. Chlorine also gets added is by using a hypochlorite salt such as sodium hypochlorite (NaOCl) which is a sodium atom (Na +) plus a hypochlorite molecule (OCl-). Hypochlorous acid (HOCl) is then formed when hydrogen ions (H +) available from water in Equation 1 combine with hypochlorite. Any hypochlorite salt (calcium, lithium) will do the same thing. The point is that they are solids and a convenient way to add chlorine. The point of showing this equation is to emphasize that pH has a profound impact on how much hypochlorous acid is present. Higher pH means fewer hydrogen ions (H+) in the solution, which drives the equation to the right which reduces hypochlorous acid levels. At a pH of 6.0 the ratio of HOCL to OCl- is 97:3 meaning that 97% of the chlorine is in its active form. When the pH is 8 the ratio drops to 24:76 meaning the chlorine is only 24% active. You could have a “good” free chlorine level with 24% to 97% of it active depending on pH. A pH of 7.2 equates to 66% active. Free chlorine levels are pretty meaningless unless the water is at the proper pH. Stabilized hypochlorites such as dichlor and trichlor have cyanuric acid compounds to protect chlorine from degradation by the sun which is unnecessary in a covered pool over the winter. Also, when the cyanuric acid level gets too high it can cause chlorine lock by binding to all of the chlorine, rendering it ineffective because it can’t participate in the Equation 2 resulting in a left shift and a lower hypochlorous acid level. Other factors that inhibit the efficacy of chlorine over the winter include the presence of particulate matter suspended in the water such as dust and breakdown products related to organic matter. Chlorine binds to those materials and forms chloramines which again removes chlorine from the Equation 2 and lowers the hypochlorous acid level. Moving on to other, perhaps more practical, aspects of springtime pool opening logically brings us to phosphates and nitrates. 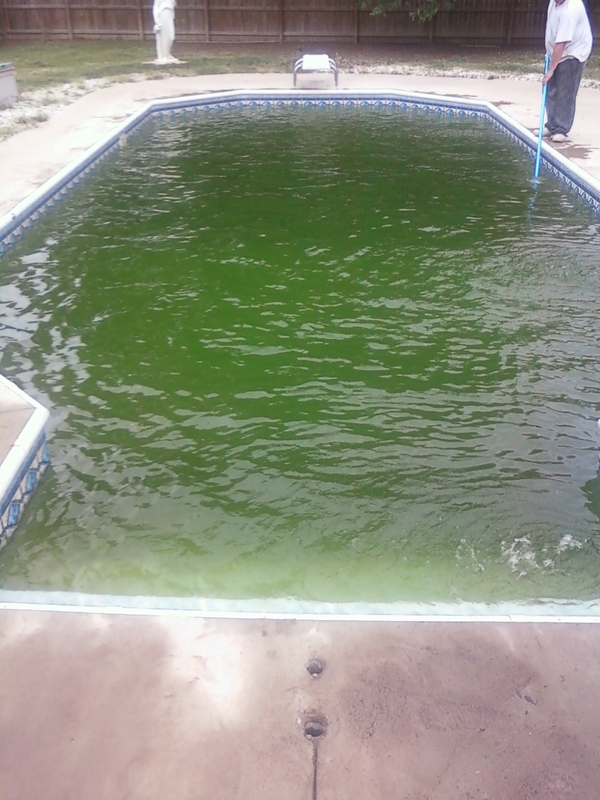 Phosphate and nitrogen containing compounds serve as nutrients for algae and phosphates are being added continuously to pools that are exposed to rain and wind. They come from landscape runoff, rain, and household water because they’re added during water treatment to prevent corrosion. Phosphates and nitrogen are recycled as the algae die and allow for new algal growth. Snakes, frogs, mice, and squirrels, both living and dead, contribute nutrients that algae thrive on. So the first step is to remove as much of the nutrients as possible when opening the pool. This means scooping out all of the visible debris that can be caught in a net. Scrub the algae off the bottom and sides of the pool. Add an algaecide to kill the algae, filter them, rinse the filter, then remove phosphates if levels are over 100 ppb using chemical binders that can also be caught and discarded through filtration. If possible, bring the pool up to a temperature approaching where you plan to use it and then measure your chemical parameters. Remember that several of the parameters will change both measurement and meaning depending on temperature. In case the pool isn’t heated, remember that hypothermia victims aren’t dead until they’re warm and dead. Alkalinity or carbonate hardness should be adjusted next. Sodium bicarbonate can be used and this is the buffer that will help keep the pH level steady which will help keep everything else from fluctuating wildly. The target level is 80-120 ppm. Adjust the pH, which will govern the level of hypochlorous acid as previously described. This will determine how well the free chloride works. There are various recommendations on target range based on pool type and structure. For water in general a pH of 7.4 is most comfortable for humans to avoid irritation of the eyes and mucus membranes. Higher pH impairs chlorine activity and lower pH can be corrosive. Shock the water with a non-stabilized hypochlorite salt such as calcium hypochlorite. This will likely be consumed rapidly while it’s sanitizing the water and exposed to sunlight. The target free chlorine level to kill algae is 30 ppm. Contact time is important and it may take 24-48 hours to drop to a safe swimming level below 5 ppm. While sanitizing the water with the chlorine shock, chloramines will be produced by combining chlorine (hypochlorous acid) with organic material or ammonia. 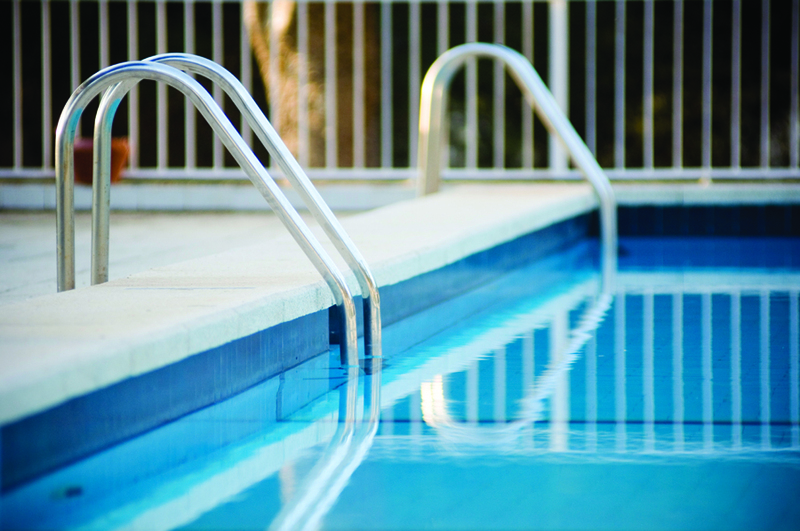 Chloramines (combined chlorine) are responsible for the smell that we associate with pools. They can cause respiratory irritation. Chloramine can combine with ammonia and nitrate compounds to produce carcinogenic nitrosamines. Chloramine does evaporate from the water, but much more slowly than free chlorine. Generally chloramine becomes a concern at levels above 0.5 ppm. Chloramine removal can be accomplished by adding chlorine to a level 10-20 times the chloramine level to break the bonds between the chlorine and the amine compounds. Once the free chlorine level drops, a stabilized hypochlorite can be added such as dichlor or trichlor until a free chlorine level of 2-3 ppm is achieved. Stabilized hypochlorite contains cyanuric acid which prevents UV degradation of the chlorine. Chlorine evaporates, is destroyed by the sun, and is consumed as it sanitizes the pool. Cyanuric acid does not. Cyanuric acid should be kept at a level below 20 ppm because higher levels can bind too much chlorine rendering it ineffective. 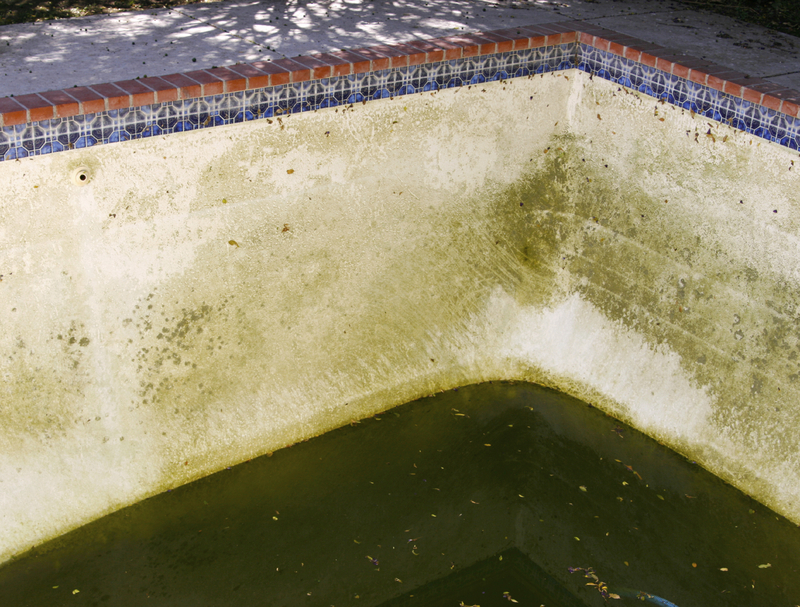 The only way to remove cyanuric acid is by draining water from the pool so it’s best to avoid high levels. If the levels are creeping up and the free chlorine is low, add non-stabilized chlorine since the cyanuric acid that is already present will stabilize it. ITS offers easy test strips to help determine a baseline for successful testing. 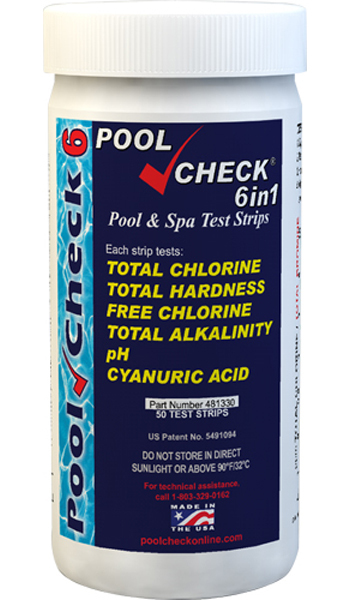 PoolCheck® 6 in 1 test covers all of the above routine testing to be done weekly in one simple to use and interpret testing strip. PoolCheck® phosphate which should be used if algae growth has been a problem. 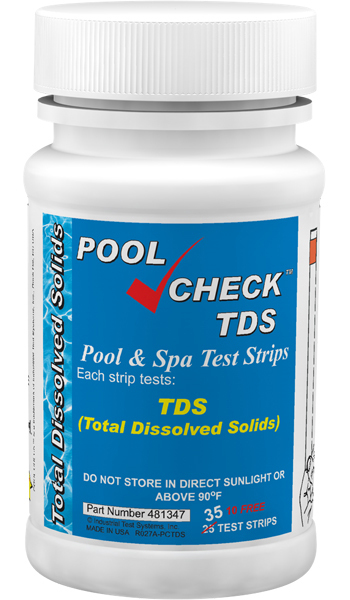 PoolCheck® Total dissolved solids (TDS) which come from dust, waste, and chemical reactions should be checked monthly since they decrease the efficacy of chlorine. The treatment for high TDS involves exchanging the pool water for fresh water.